Joining us for the third convention was the wonderful Patrica Quinn. 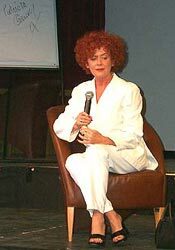 Patricia has always been one of the most popular guests at the Transylvania conventions, and we were honoured to have her at Transylvania 1999. Patricia answered many questions from the fans. (Audience) "Do you have a favourite out of Magenta and the Usherrette?" (Patricia) "I loved Science Fiction Double Feature. I auditioned with Richard O'Brien, and he started signing with me and I loved it. The Usherrette was an extraordinary part to play, Magenta only had four lines in the origianal show. The movie opened up her character. The incestuous relationship wasn't planned as such, the alien sign (elbows) evolved in the movie to a kiss on the neck and that's where the incestuous idea came from." (Audience) "Did you prefer the movie or the show?" (Patricia) "At first I didn't want to do it as I couldn't sing Science Fiction Double Feature, but when I saw the costume and set designs I decided to do it. Jim Sharman said he wanted me to be the lips at the start of the movie. I went to Elstree studios, had my head put in a clamp and was blacked out and that was the first animated lips singing a song. My lips travelled a long way." (Audience) "What was your favourite Shock Treatment or Rocky Horror?" (Patricia) "Rocky Horror, Shock Treatment was a good idea that just didn't quite work out." (Audience) "Do you ever get fed up with people knowing you as Magenta?" 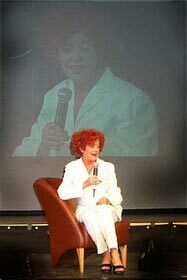 (Patricia) "Never, twenty one years after we were first on stage I was on tour with it for the first time in my life. I've very proud of being Magenta." (Audience) "What happened in the dinner scene in the movie?" (Patricia) "I never knew what was under the cloth, the reaction on screen is real, Richard told me recently that no-one on set knew there would be Eddie's body under the cloth." (Audience) "What was the funniest thing that happened on the set of RHPS?" (Patricia) "I don't know if any of it was that funny, it was such hard work. There were some funny things. When Meatload came to join us, we were rehearsing at the White House Hotel in Earls Court. In came this guy, I'd never met him. He said 'Hi Hon' then he sang Hot Pattotie and the chandaleir really shook! He told me he was the best kisser in Texas and I thought OK let's see what that's like." (Audience) "What was it like working with Tim Curry?" (Patricia) "He was great, when we started he was less well know than I was. He was so involved in his role in the film that I didn't see much of him." (Audience) "Did you base Nation on Magenta?" (Patricia) "I thought I made her different, she looks the same because it's me!"